Simplicity is key. But complexity is intriguing. I would say this salad incorporates both of these elements. 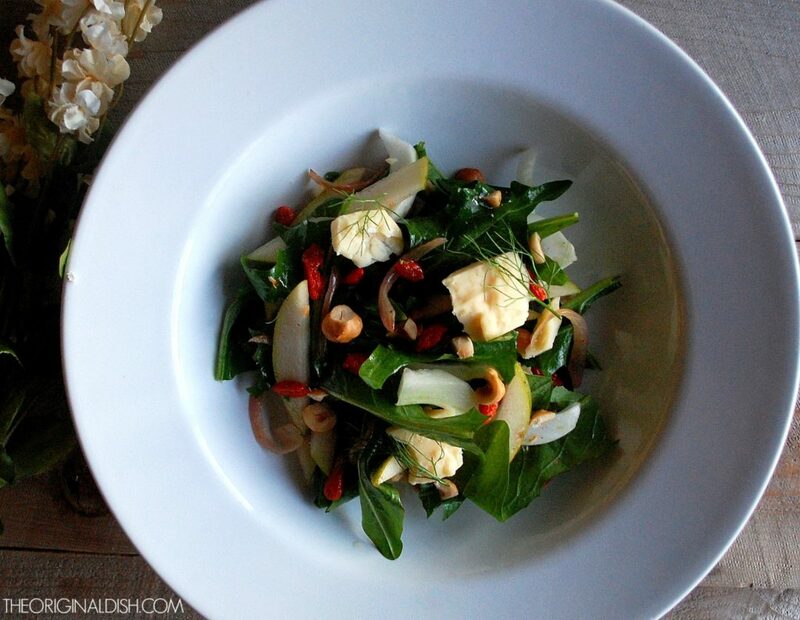 And the result?…a beautiful winter salad that’s easy to make, yet leaves you wanting more with each bite. Eating healthy this winter means lots of salads. They’re quick for busy nights, plus raw vegetables and greens are better for you than cooked ones. I like to prepare some sort of lean protein, usually chicken or fish, and eat it alongside a huge bowl of salad. You can pack so many nutrients into one, delicious salad, so why not take advantage of that? Instead of using up all of the vegetables I have in my fridge, like I usually do, I made this salad a bit more specific. Finding simple ingredients that work perfectly together is one of the main beauties of a salad. 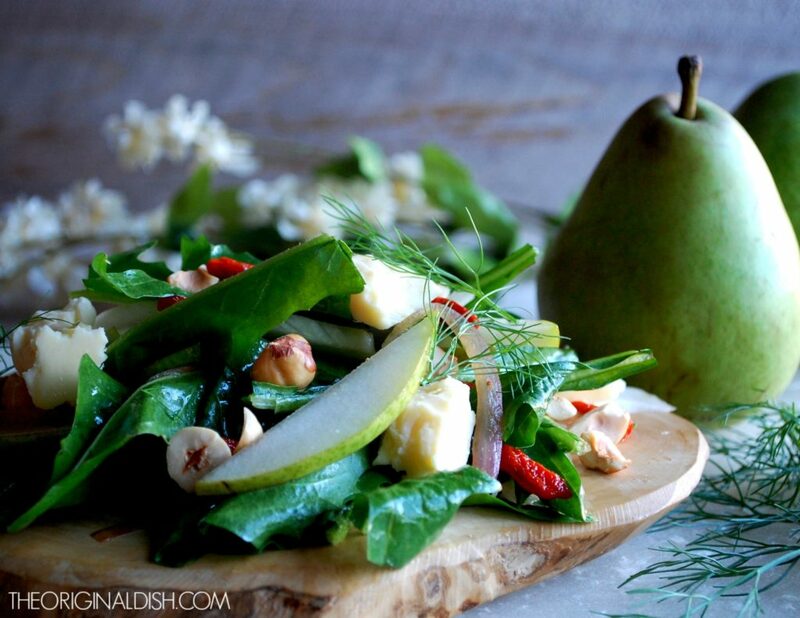 Clean, fresh, and packed with flavor…exactly what this fennel and pear salad is. 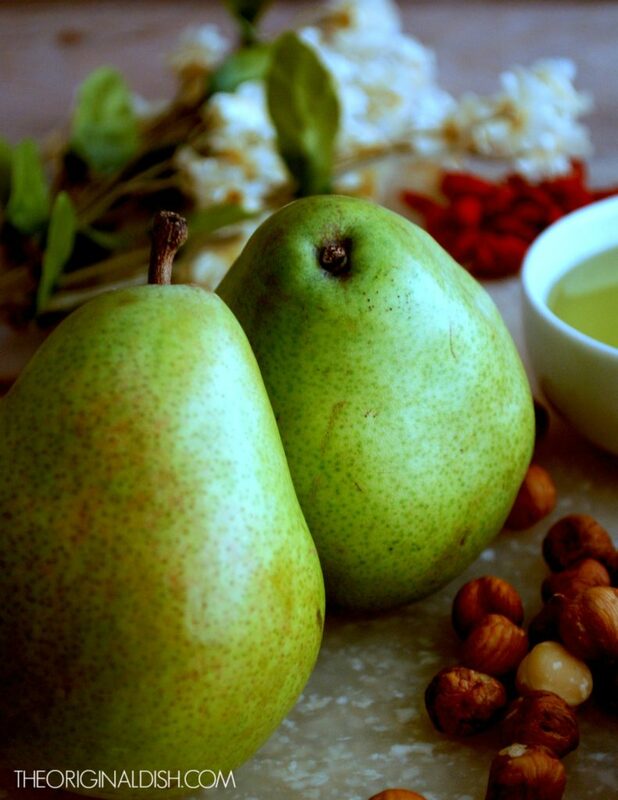 I’m using a winter pear known as Anjou in this recipe. They’re available from October through May and are incredibly juicy when ripe. I wanted a contrasting crispness, so that’s where the fennel comes in. It’s licorice taste works well with the sweet pears. I slice the fennel bulbs thin, and instead of immediately discarding the tops, I pick off some fennel fronds to use as a garnish. 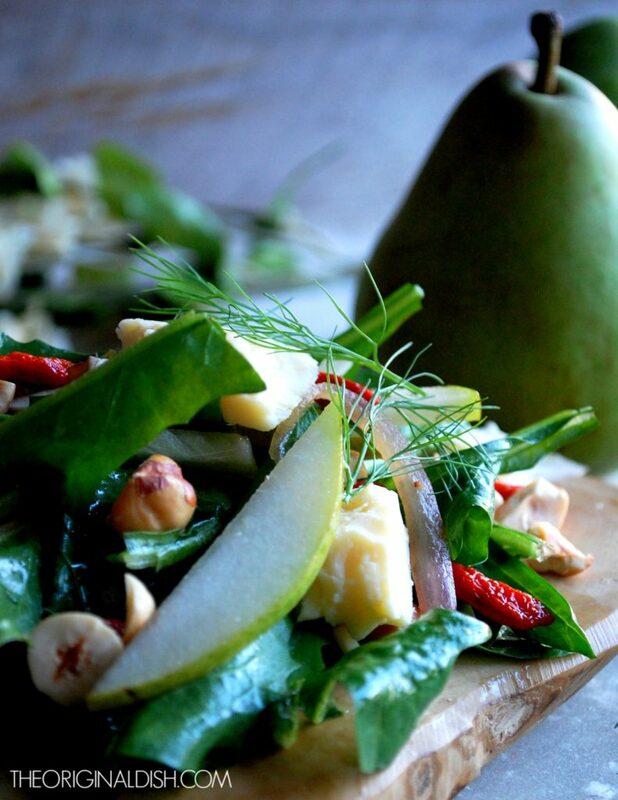 I like to go heavy on the fennel and pear in the salad, but even so, you need some greens as a base. I use dandelion greens mainly because they’re something not so traditional, but also because they add a little bitterness to cut down the sweetness of the pears. Now for some toppings and of course, the vinaigrette! 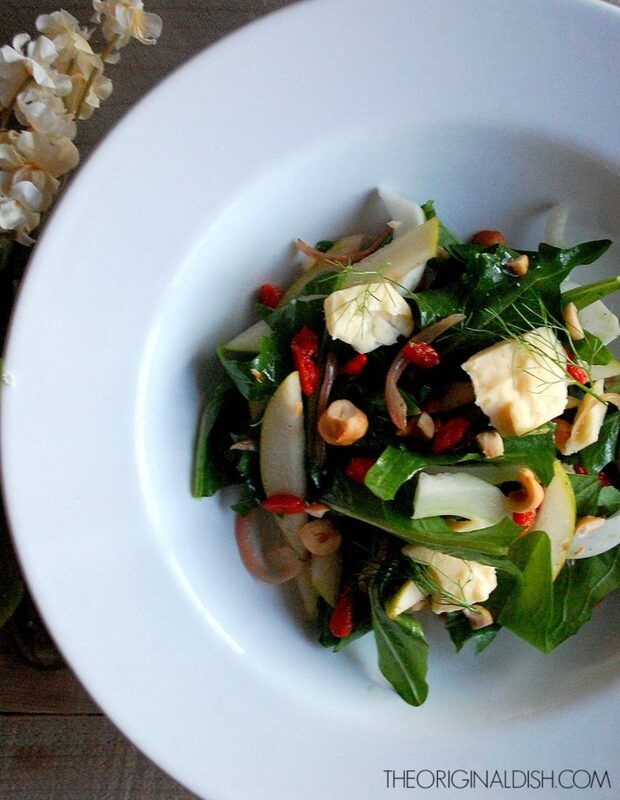 This vinaigrette is fairly straightforward but contains a special ingredient: goji berries. They’re known as a “superfood”, and I just love them. Packed with nutrients, these little berries are so versatile. I eat them by the handful, on top of yogurt, as part of a smoothie, with vegetables, as a sauce…you name it! And so it just made sense to use them in a salad. I start the vinaigrette on the stovetop so the berries can plump up in the warm vinegar. Just a few other ingredients, and the vinaigrette is ready to be topped with roasted hazelnuts and smoked cheddar cheese. This crunchy, creamy nut-cheese combination is what makes the salad an absolute favorite. Enjoy! In a medium sauté pan, heat the 1 tablespoon of grapeseed oil over medium heat. Add the shallots and cook for 3 minutes, stirring occasionally. Reduce the heat to medium-low and continue to cook until the shallots are soft. Stir in the vinegar, goji berries, and fennel seeds. After two minutes, turn off the heat and let the mixture cool. Transfer it to a mixing bowl and gently whisk in the mustard and lemon juice. Slowly drizzle in the remaining ¼ cup of grapeseed oil, whisking until incorporated. Stir in the parsley and season with salt and pepper to taste. 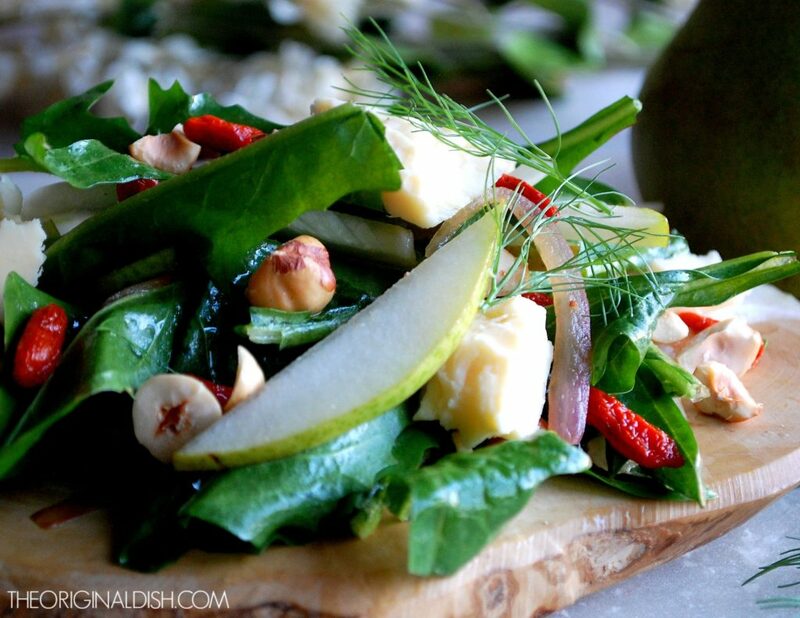 In a large mixing bowl, toss the pears, fennel, and dandelion greens with the vinaigrette (reserve any leftover vinaigrette for another use). Taste and add more salt or pepper if necessary. Add the smoked cheddar and roasted hazelnuts. Gently toss to combine. 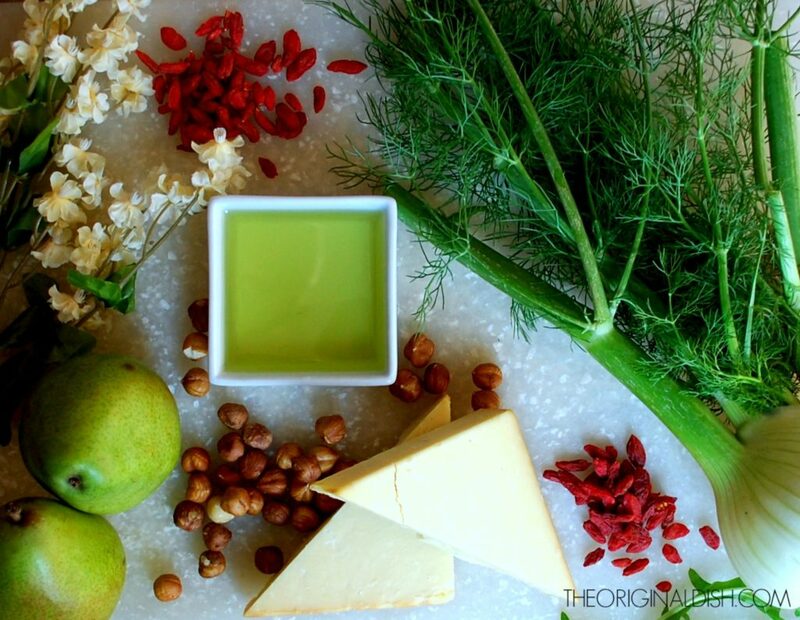 Serve each salad with a garnish of fennel fronds. I also like to sprinkle on even more cheese and nuts to each individual salad. To roast your own hazelnuts, spread them out onto a baking sheet and pop them into the oven for 10 minutes at 350°F. Transfer them to a kitchen towel while they are still hot. Wrap them up and use the towel to give them a good massage, essentially rubbing off their skins. (Don’t worry if the skins don’t entirely come off.) Let cool and use in the salad. All of the salad ingredient measurements are just rough estimates. 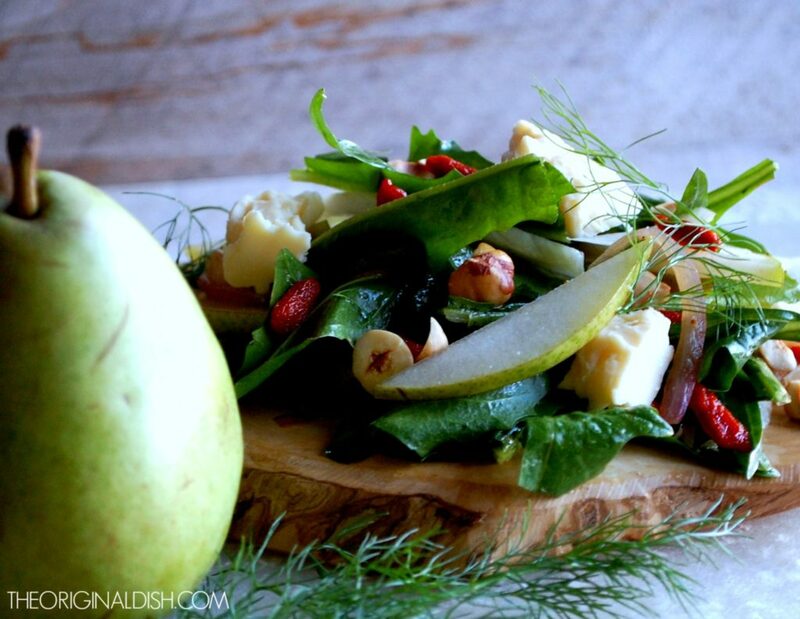 Build your salad to the size you prefer, with as few or as many pear slices, fennel slices, etc. as you’d like!